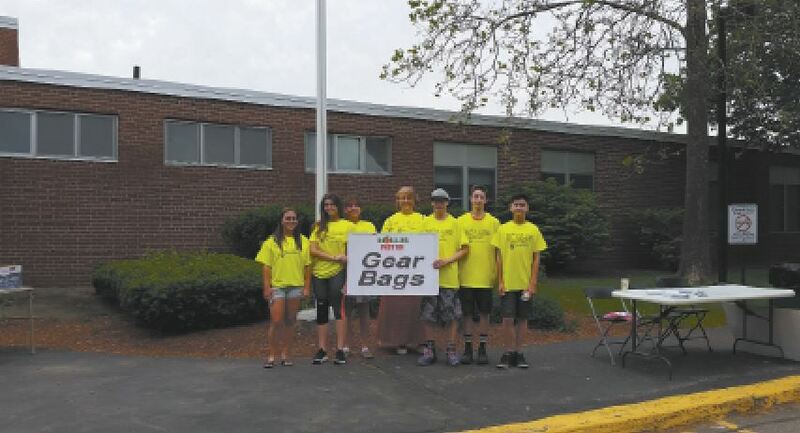 Hailey Tiner, Julia Frugard, Susan Holroyd, Erika Cross MacDonald, Brian Holroyd, Jared Sanborn and Oliver Hugh pose in front of Hollis Brookline Middle School before the start of the race. The Hollis Brookline Rotary Interact Club spent an afternoon at the Hollis Fast 5k Race on June 8, where there were more than 1,400 registered runners. They arrived at Hollis Brookline Middle School at 4 p.m. to help with the setup, and manned water stations and guarded racers belongings during the race.